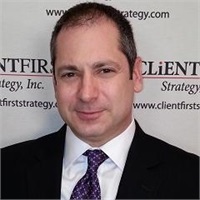 Mitchell Goldberg, AIF®, AAMS | ClientFirst Strategy, Inc.
Hello, I’m Mitch Goldberg. I’m a financial planner and I work directly with my clients in investing, financial planning, and insurance. I’m also a nationally recognized specialist in markets, investment strategy, and economics. I write a lot about these topics, mostly for CNBC and my own email distribution list. It helps that I’m a news junky and somewhat obsessive (my wife would tell me to drop the “somewhat”) about current news. But this is fun for me and I believe it helps me do a better job for my clients. When it comes to working with my clients, my style is to take a consultative approach. Advising clients, in my opinion, is an ongoing process as opposed to a one-shot recommendation. If you were to ask me what’s in a name, I would answer "everything". That is exactly why I named my firm ClientFirst Strategy, Inc.
Whatever you say, whatever your reactions are to my questions, I will take you very seriously. It is your input that will form the basis of my advice to you, which in turn, will allow me to develop a sound strategy that puts your best interests first. I am not beholden to a large financial services company, which is why my advice and recommendations are unbiased. Having been in the investment business since 1990, I have always been a strong believer in continuing education. Most recently I have earned the AIF® (Accredited Investment Fiduciary®) designation in 2018. Attainment of the AIF designation demonstrates understanding of the Prudent Practices® and methodology. I have also earned many licenses; General Securities Representative Exam, Uniform State Law Exam, Uniform Investment Advisor Law Exam, General Securities Sales Principle Exam, Accident, Life, and Health Insurance Licensee, and AAMS (Accredited Asset Management Specialist). Also, I am a member of the Long Island Elite networking group, in which I currently serve on several committees and have served as a board member. I’m also a member of the board of trustees of Temple Beth Torah in Melville, NY, and I’m a member of the Financial Planning Association. I’m former co-chair of the March of Dimes Long Island Real Estate Awards Committee. Outside of the things that I have to wear a fancy suit, I’m very into weight lifting, golf, hiking, beach walks, rollerblading (yes, that is still a thing), and barbecuing. Basically, I love being outdoors and active. My wife and I met in college, State University of New York at Albany. We live on Long Island where we are raising our three children.